Wicker Park Dental Office | Now Accepting New Patients! 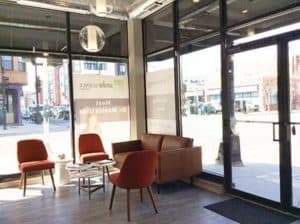 « Our Wicker Park dental practice is on Zocdoc! Smile Science Chicago, your local Wicker Park dental office, is now accepting new patients. We accept patients with and with out dental insurance. You can email our office or complete an appointment request on-line. We even have an on-line patient registration system available through a secure new patient portal. We would love to meet you and give you a tour of our beautiful Wicker Park dental office. We are located at the corner of North Avenue and Wood across from the Gallery Cafe and FedEx Kinkos. Stop by and take a look at our practice through our big open windows.